When my oldest daughter, Cassie, was 8 or 9 years old we found a wonderful art class for her through our local art league. One of the artists she learned about was Georges-Pierre Seurat, who painted with tiny dots. "Seurat the dot" (yes, a little pronunciation fudging), her teacher taught her ... and that little rhyme stuck for her and me, to this day when one of us sees a dot painting we know who made it, or at least who inspired it. 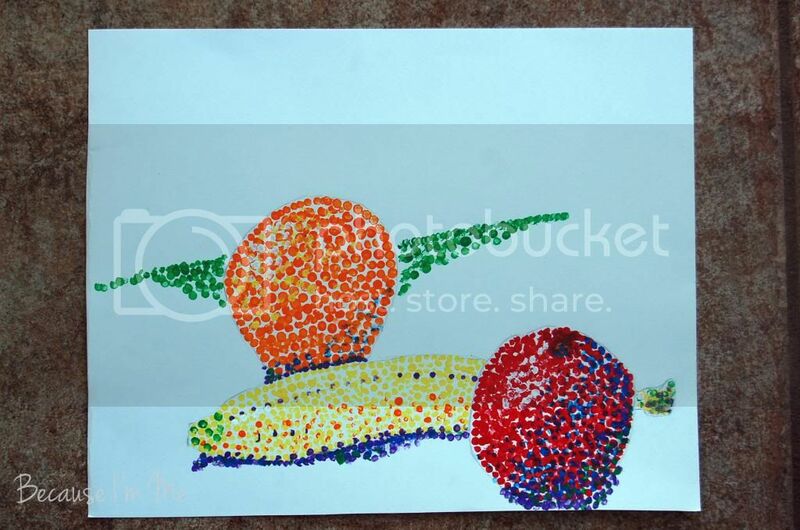 I was recently given the opportunity to review a DVD entitled Pointillism Fruit with Pat Knepley, available through See the Light. The DVD contains four complete step-by-step lessons totalling 96 minutes. 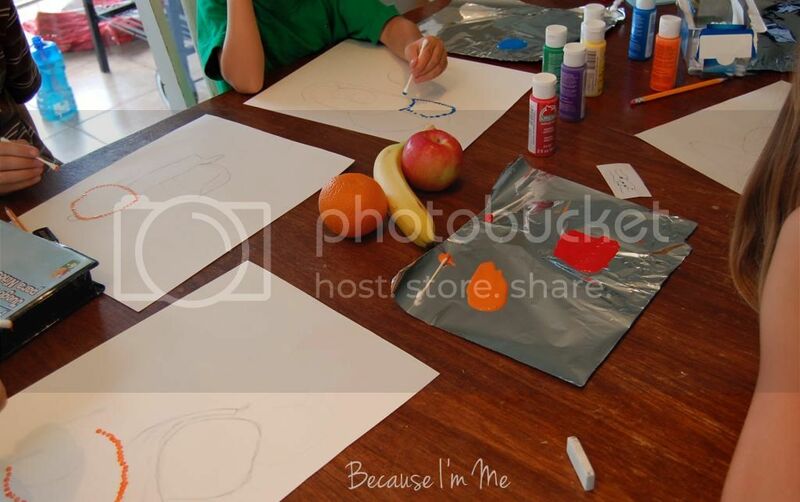 Each lesson contains history about the artist and the time period, information about the technique and art elements, and the "how to" information needed to create your own masterpiece. In addition to the DVD materials required include cotton swabs, poster board or art paper, a pencil, and a variety of acrylic paints. Pat Knepley is an enthusiastic artist and teacher. She is very conversational, without going overboard. Her lessons are presented clearly, knowledgeably, and patiently. There is a Christian element to each lesson, which I was aware of ahead of time, with a few minutes dedicated to a lesson focusing on the Bible and Christianity, throughout the rest of the lesson it isn't mentioned. As a secular home schooling family I found it noticeable, not overwhelming, and didn't mind it at all. After the kids had gathered their supplies they sat down with the DVD and watched the lessons. One of the blessings of the DVD is that the kids were able to stop or replay as needed to be sure they understood the technique and lesson. We broke the lessons up over four different days, to avoid getting overwhelmed. We spent about 4 hours total watching the DVD and doing our projects. Mia (13) seemed to grasp the concepts quickly, I think her previous art classes gave her an advantage. Adam (11) said, "I liked it because we learned about an artist. I liked it because I liked pointillism art. I thought it was a fun project.". Kaden (10) did find it a bit frustrating, making lots of little dots and then adding lots more little dots for depth and shading takes time, but he stuck it out and said, "This kind of art would inspire other people to do more art. I want to do more art. This is a good program for people of all ages. This will be good for everyone." River (4), well, he really got the dot making part but the rest of it was a little over his head, as expected. I liked this program. 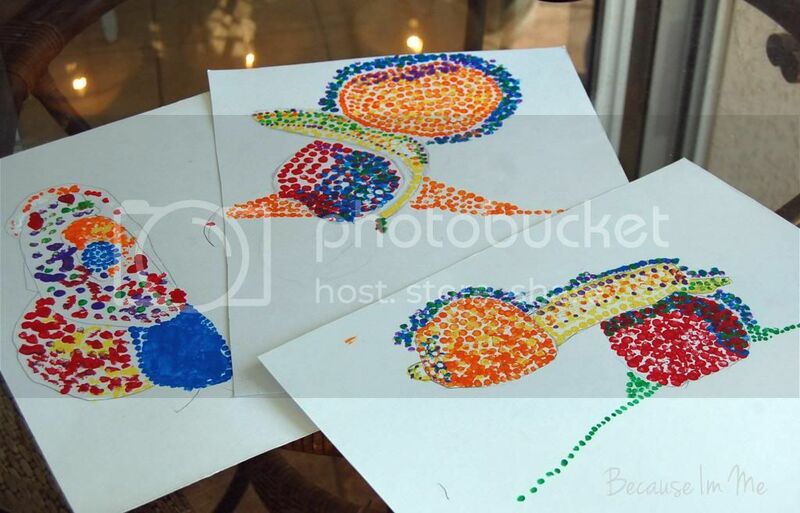 I appreciate that the kids learned more than just drawing with dots; they also learned art history, technique, color mixing, and color value. Having the DVD will allow the kids to pick it up and do the program again any time they'd like. Pointillism is recommended for kids aged 10+ and is available at See the Light for $14.99.